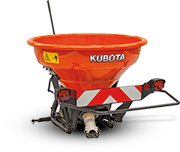 The Kubota Vertical spreader is a proven solution for the use on dairy farms, vineyards, general agriculture and golf courses. These spreaders have the best spreading pattern for even distribution. 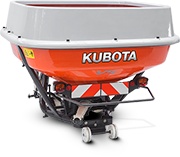 A variety of spouts for different applications and working widths makes it possible to spread fertilizer, seeds, sand, salt, pellets or any other granular product.